Crafting on the go is common for many of us. When our busy schedules take us all over the place there always seems to be some kind of waiting time. Waiting for an appointment, waiting for the kids to finish practice, even the wait while we travel to Gramma’s house during the holidays. All of these times are perfect to get a little more work done on our projects. Take along projects can help us get more done when we’re busy people. When you take along a project, there are some considerations. You want it to be easy to handle, especially in tight places, like while sitting in the car waiting. You also want to be able to close it up quickly when it’s time to do something different. Think about tools you may need. Consider the size of the project. Be aware of the weight you’ll add to what else you carry. Make sure you have craft tote that is dedicated to your project on the go. Simple, small projects that require few tools, other than a pair of scissors, are best options for crafting on the go. There are many small project ideas right here on Crafter’s Kingdom. 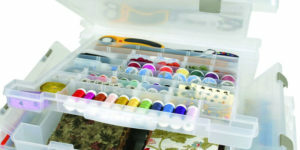 Try out some felt kits for the holidays or maybe a cross stitch kit is more to your liking. Carry along organizers are a great help. They are large enough to hold what you need and keep everything organized so that you can find what you need easily. But they are also small enough to not add weight or bulk to what you carry. Personally, I use several carry along organizers for my projects. I keep one ready so that I can just grab it and go. When I’m under time limits to get a project done, I use my craft organizer to work at home and on the go. My preference is a carry along organizer that has plenty of little spaces. I want to keep all of my tools and supplies easy to find and grab when I need to. Whether it’s on the go or at home, my crafting time is more efficient. With any kind of crafting, a little planning goes along way. So plan your craft projects that you will work on while away from home. Get yourself a tote or carry along organizer and make use of that waiting time. You may be delighted at how much you can get done.